Arrival (2016) – Movie Review – Another Movie Blog! In Ted Chiang’s “Story of Your Life”, upon which Arrival is based, a key plot point revolves around the explanation of Fermat’s principle of least time, and how that determinism relates to the language in which the Heptapods, the visiting aliens, write. It’s the kind of engaging writing that is the absolute death nail to the actions that drive cinema, and so of course is not in the final film. Fortunately, Eric Heisserer’s screenplay understands what concepts work in both his medium and the intentions of director Denis Villeneuve and company. The result is the most overtly heady science fiction blockbuster in quite some time, more so than the admirable but flawed Interstellar. But what both at least understand is that a story’s intellect must be balanced with its emotion, and in Louise’s (Amy Adams) process of grieving for a lost daughter whilst learning to communicate with visiting extra-terrestrials, they find that merging point. Other actors turn in fine performances, including Jeremy Renner putting his stoic charm to good use, but this is Amy Adam’s show. Like the Heptapod language, Arrival would not be well translated without her guidance, her dark black eyes conveying intelligence, tragedy and the willingness to let others experience both. Regardless of the film’s linguistic lessons, Denis Villeneuve extends this theme of communication as wide as it can possibly go. In finding the sort of conflict that satisfies a larger audience, the movie beefs up the international incidents and conflict surrounds the alien visitation. Villeneuve’s movies, from Prisoners to Sicario, have until this point traded on a good deal of nihilism added to subverted genre tropes. The latter is still there, but the former has been almost drastically shifted, for Arrival’s main themes arrive at the possibility of human beings to communicate, engage and thus improve collectively. 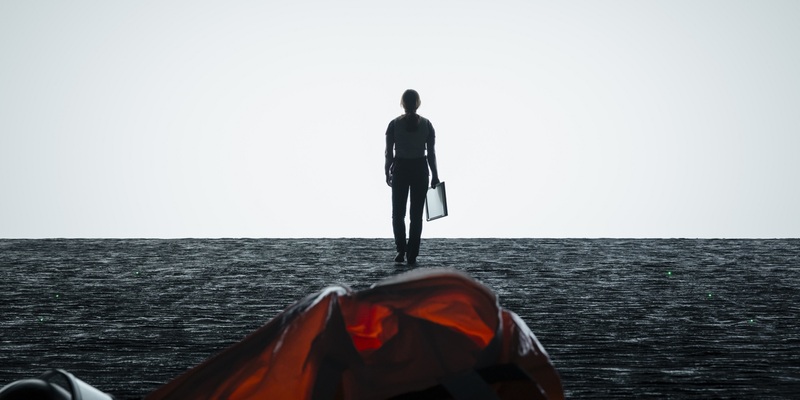 With a Trump presidency and growing isolationism making that future feel more distant, for Arrival to come out now feels serendipitous, cathartic, even necessary. But this message of global unity is undermined a good deal when all the key countries are defined by their most stereotypical movie traits. America and Britain are the key intellectual forces – but of course Britain will bail when the going gets tough – Russia and China are brutish warmongers, and barring perhaps one line from Denmark the other countries get barely a mention. The Chinese inclusion is certainly more critical than the more pandering aspects of The Martian, but regardless of your own political beliefs the movie never quite manages to reconcile the scepticism and optimism. Upon learning that Louise’s dreams and memories are visions of her future life made possible by the alien language, the movie feels the need to one up itself with Louise stopping the Chinese assault by sending a message from her future self to her past self, the kind of Bootstrap paradox that about 60% of new Doctor Who episodes are predicated on (and is not in the original story). This need to add tension lies in contrast the elegiac tone of the ending in a way that seems unnecessary. As does the need to change the death of her child from a freak accident to a terminal disease. The latter would be unpreventable regardless of the foresight given to her by the aliens, the former makes the conflict of knowing life going forward palpable and more of a conflict. Also, leaving aside the question why Louise is the only person who experiences this language (best answer: it’s the story of her life), the original text theme was more dictated by structure, switching back and forth between the timelines in a way that comes to a circular structure like the seismographs the written language of the Heptapods. At the cost of a good Twilight Zone gotcha, all these changes miss a trick to even more compliment Louise and her emotional arc. It has been a long time, though, since I’ve complained that a movie of this size was too clever at the cost of emotion. Arrival has, for an unavoidable pun, arrived at the most appropriate moment, where questions of understanding other cultures and not secluding ourselves has been at their most important since the Second World War. Its up to us to decide if we want to learn the language.